Some experts say that 95% of people feel some fear or anxiety when called upon to give a speech or presentation. Feeling fear when giving a speech is normal, and it doesn’t have to stand in the way of making a great presentation. This new 7 minute coaching session quickly reviews seven techniques to reduce fear and boost your confidence when making that business speech or presentation. Humor is your weapon to win attention. Humor is your tool to stand out. Humor is your winning edge. For those who need a less aggressive metaphor, humor is the icing on the cake that makes your message attractive and a pleasure to consume. This new 7 minute coaching session quickly reviews seven actions you can take to add humor to your business speech or presentation. Not only is poor speaking is widely tolerated in business, poor use of presentation software is practically encouraged. Well it doesn’t have to be that way. You can avoid death, despair, and boredom by powerpoint. This 7 minute coaching session offers seven actions for using Powerpoint, Keynote, or other presentation software to make your presentations stand out. A speech is like a dance, with the speaker and audience as dance partners. Sometimes leading, sometimes following, effective speakers engage - dance with - their audiences. Engagement both takes energy and builds energy. This 7 minute coaching session outlines seven ways that you can maintain and increase the engagement and energy of your audience while making your presentation. 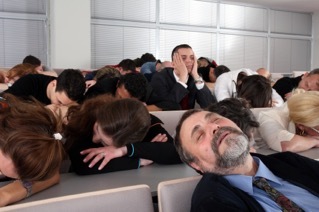 How you start your presentation or speech sets the audiences expectation. If you begin with a strong opening, end with a powerful close, and have relevant material in the middle, listeners will forget and forgive any parts that are uninteresting or less than well done. They will perceive the entire presentation positively as a whole. This 7 minute coaching session covers the essentials of crafting a powerful opening, and includes seven different ways to do it. Poor speaking is so tolerated as normal for business that perhaps no other skill gives as quick a payback for effort as learning to speak with clarity, brevity and energy. Small and basic improvements in speaking in front of others will typically elevate one well above the crowd. Plus effective speaking is one of the best tools for cultivating influence. Acquiring the skills to improve speaking is not actually difficult to do, but takes time, practice and discipline. The following are a seven key practices to develop speaking mechanics and delivery. To receive the summary leadership article in PDF format and email links to all the podcasts - FREE - then be sure to sign up on our email list for both THINK! e-zine and 7 Ideas Coach. Bonus - 101 Leadership Quotes and summary articles for the three previous series topics when you subscribe.